China will overtake the US and dominate global trade by 2030, a leading accountancy firm says. China's global trade is set to surge past the US' by 2030, according to a report by PricewaterhouseCoopers (PwC). Currently, China's international trade is worth $2.21 trillion (£1.36tn), compared with the $2.66tn (£1.64tn) for the US. 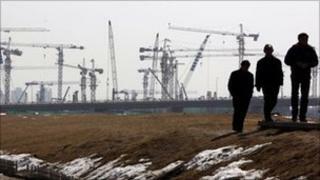 China was confirmed as the world's second-biggest economy earlier this year, overtaking Japan. According to the report by PwC, the coming years will see global trade undergo "fundamental change" as emerging economies such as China and India begin to "dominate the top sea and air freight routes". PwC's findings are in line with the World Bank's prediction that China's economy will eclipse the US by 2030, if it can sustain its growth. Its chief economist Justin Lin said on Wednesday that, if China continued to grow at an annual rate of 8%, it would be twice the size of the US economy in 20 years. China is responsible for much of the world's production of material goods, helping to maintain the country's position as an economic superpower. According to data by PwC, China is in a dominant position in terms of bilateral trade. It appeared in 17 of the top 25 bilateral trade pairings in 2009. The country has used its huge labour force to cut the costs of production to maintain a competitive edge against other countries. China is the world's largest goods producer, with 19.8% of all manufactured products coming from the economic heavyweight.